You may have noticed that your child’s first few words contained some familiar terms that you frequently say. When you put your sunglasses on, does your child demand to wear a pair of his own? Developmental psychologists have long been aware of the fact that children model their behavior after adult behavior. That gives you an opportunity to model behavior you’d like to see from your child. Take a cue from your childcare provider, who likely knows what to model, and what not to model, in order to see kindness, patience, honesty, and empathy flourish, even at that ever-so-difficult toddler stage. 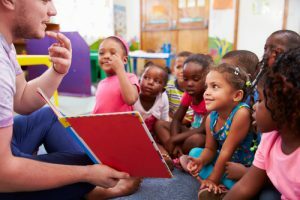 Most daycare and preschool teachers are experts in modeling positive behavior for the children they care for each and every day. In fact, it’s second nature for many childcare providers. One of the key ways that teachers exhibit positive behavior for their students is to show respect to each student, even on tough days. At daycare, your child’s teachers listen to him and make it clear that it’s important to them to understand his concerns, his motivations, and the things that are important to him. Even if he doesn’t get his way, he feels listened to and respected. This will encourage your child to listen to you at home, to his siblings and friends, and to his teachers as well. Another way that daycare and preschool teachers model respect is by owning up to their own behavior. If they make a mistake, they are honest about their misstep, and apologize for it. This allows children to see that mistakes happen and are nothing to be ashamed of, and that apologizing and improving one’s behavior is more important. Teachers help their students to learn a variety of things throughout their young years, and one great way to help them learn is to show them the process by which adults learn and solve problems. If a teacher is helping a child with a challenge, she might talk to the child about her own thought process as she thinks through an issue. This will help her student to understand how adults get from point A. to point B., and will allow them to develop their critical thinking skills and abilities to problem-solve. Another great way for adults to model good behavior is to position themselves as role models. When adults talk about the positive aspects of their lives that they are proud of, they might just spark interest in a young mind. If a daycare provider is chatting with a group of kids, and mentions that she runs marathons, that may inspire the young athletes around her to look up to her as a role model. If a teacher mentions that he sold one of his paintings a few weeks ago at an art show, young kids with artistic leanings may learn the valuable lesson that art and expression is important, and may ask their parents if they can sign up for a class. Parents can learn a lot from the ways in which childcare experts model good behavior for children. Because our children imitate us, it’s a great idea to begin teaching your kids by example to show respect to one another by listening and apologizing, to focus on problem-solving and think through their challenges, and to pursue dreams and past-times that make them happy. Seeing well-rounded adults who patiently work through challenges and treat everyone with respect is essential to young children.